When the stars hit the orange carpet Saturday to celebrate the 22nd Annual Kids Choice Awards, The Children's Place was on the scene. While Dwayne Johnson hosted and The Jonas Brothers performed, celebrities flocked backstage to The Children's Place lounge. Everyone who stopped by scored a The Children's Place t-shirt the perfect basic for any outfit. Stars also stopped by The Children's Place craft stations to decorate their own The Children's Place messenger bags, which will be auctioned off to benefit the Books for Kids Foundation. 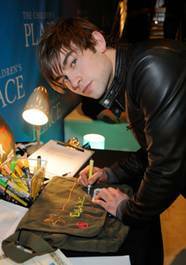 Celebrities like Paula Abdul, Chace Crawford and David Archuleta took a break backstage to design messenger bags for the cause. Founded to promote literacy among all children with a special emphasis on low-income and at-risk preschool-aged children, Books for Kids creates libraries, donates books, and partners with literacy programs to develop the critical early foundation and skills which young children need to be successful in life. Since its founding in 1986, the Books for Kids Foundation has provided children with more than 5 million books, created 56 libraries and provided literacy programs in many of these locations. The celebrity-designed messenger bags will be auctioned April 14th - 24th, with all proceeds going toward fostering literacy through the Books For Kids Foundation. Please visit www.ebay.com/thechildrensplace to place your bid. The Children's Place carries favorite head-to-toe looks for boys and girls, sized newborn to 14. Offering everything from casual basics to comfortable dress wear, The Children's Place has all the mix n match styles kids love. With must-have fashions made of quality materials all at an unmatched value, The Children's Place makes shopping fun for everyone. Visit the online store @ childrensplace.com or shop any of the 900+ stores throughout the United States, Canada, and Puerto Rico. Read more Children's Fashion News.